One mom is concerned because her 8-year-old son wets the bed at home but not during his extended stays with his grandmother who lives out of state. Another wonders why her 10-year-old stepson wets the bed when he stays at her house but not at his mother's house. According to Dr. David Fay, a family physician and associate director of the Waukesha Family Practice Residency Program in Waukesha, WI, bedwetting (or nighttime wetting) in separate homes is fairly common. Managing the issue requires communication and cooperation among all parties. There is no single "cause" that has been identified as being responsible for nighttime wetting. Genetics are a major factor, as is bladder capacity. Dr. Fay believes the combination of bladder capacity and emotional stress can trigger nighttime wetting in kids who live at more than one address. Children who have wet the bed all along and have already been evaluated, undergone treatment, shown some improvement and have begun wetting again. Children who have never wet the bed and have started to do so in one home or another. In the first case, Dr. Fay says that for some reason, the child's perception of the household where he wets the bed is different from his perception of the other home. It may be that in one household the parent is diligent about monitoring fluids in the hours before bedtime and generally sticking to whatever routine they have established to help the child keep from wetting the bed. This routine may not be adhered to in the home where the child wets. The way to solve this problem is for the adult parties in the two homes to compare their routines and make sure they are as alike as possible. In the second scenario, Dr. Fay says the reasons could be emotionally driven. That means the child is so upset by whatever is going on in her life that one manifestation of the upset is nighttime wetting. As for the sleep component, Shelly Morris, director of the Enuresis Clinic of America, says in a household where a child doesn't sleep as well or as soundly, she may not wet the bed. "It's the same situation as when an adult is in a strange bed, such as a hotel room," says Morris. "When you're in a different place, you just don't sleep as well. If a child doesn't get into that deep sleep, he may wake more easily to go to the bathroom." Morris explains that this is often the reason children who wet the bed sometimes do not do so at a sleepover or the first few days of camp. It can also apply, however, to a child who visits a relative for overnight stays or who splits his time between divorced or separated parents. The keys to solving the problem are cooperation, communication and consistency between the two households. When the two parties can communicate and are willing to work together, there are a number of strategies for managing nighttime wetting. These approaches are discussed in detail on the GoodNites® website. The important thing is for everyone involved to think of the best interests of the child. The most crucial thing to remember is to manage nighttime wetting in a way that's best for the child and your family. This may mean solving the underlying problem that the nighttime wetting may indicate or merely waiting for the issue to resolve itself naturally on its own. Until it does, easing their worries by being open about it and helping to keep them dry will result in a happier child and a happier family. Get the child's point of view. 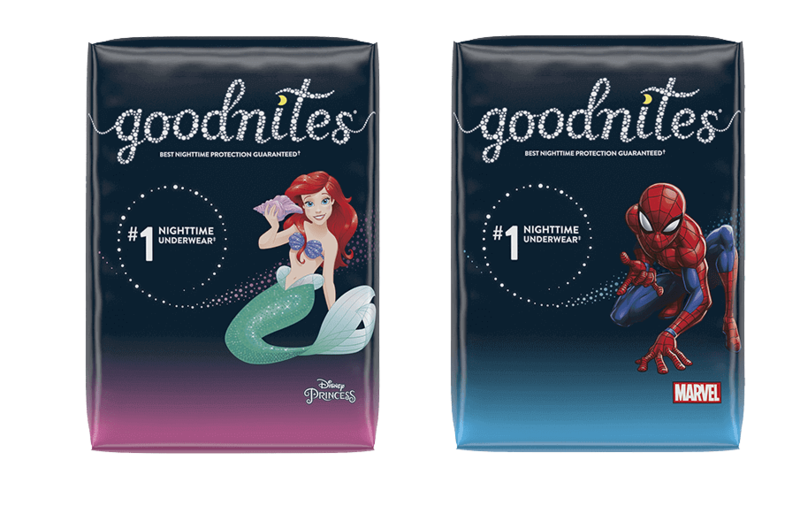 If they think the bedwetting is not a problem and is comfortable wearing GoodNites® NightTime Underwear or GoodNites* Bed Mats to bed, then it's best to just deal with it very matter-of-factly. Habits such as making sure your child uses the bathroom before bedtime and even taking them there one last time before you go to bed may help prevent possible accidents.